"The people made their voices heard loud and clear: no to dictatorship, yes to liberty." Opposition activists hold a large Venezuelan flag during a protest in Caracas, on July 24, 2017. Nearly eight million Venezuelans recently voted during the popular consultation organized by the Parliament. The people made their voices heard loud and clear: no to dictatorship, yes to liberty. Up against the wall by demonstrations of millions of people demanding a return to democracy and the rule of law, President Nicolás Maduro said that a constituent assembly would be called upon to define a new constitution that would replace the Venezuelan Constitution of his predecessor, Hugo Chávez. Members of the Constitutional Assembly would not be elected in open elections but selected from social organizations loyal to Maduro. The project of a constituent assembly would enable him to eventually dissolve the National Assembly, which the Supreme Court controlled by the regime had failed to do last May in a so-called judicial coupd'état. The court was forced to reconsider its decision to give itself all the powers of Parliament after the massive public demonstrations. Venezuela's President Nicolas Maduro speaks during a ceremony to mark the birthday of the South American independence leader Simon Bolivar in La Guaira, Venezuela July 24, 2017. The opposition, which holds the majority in Parliament, claims that Maduro's initiative is contrary to the 1999 constitution that was adopted at the initiative of President Chávez. Therefore, the National Assembly launched the July 16 popular consultation for the Venezuelans to demonstrate their opposition to the dictatorship of Maduro. Do you reject the creation of a Constituent Assembly proposed by Nicolas Maduro without the prior approval of the Venezuelan people? Do you require that the national armed forces and all civil servants obey and defend the 1999 Constitution and support the decisions of the National Assembly? Do you agree that the public authorities be appointed in accordance with the provisions of the Constitution, the holding of free and transparent elections and the formation of a national unity government to restore constitutional order? More than 98 per cent of the voters supported the opposition and the parliamentary majority by answering yes to the questions asked, thus delegitimizing the constituent assembly a few days before its convocation. Yet the regime has used all means to derail the voting process. It used violence. In Caracas, paramilitaries even fired on the crowd. The government threatened to restrict the distribution of food and to make people who would vote lose their job. The media were prevented from disseminating information about the plebiscite. Opposition demonstrators clash with riot police ensuing an anti-government protest in Caracas, on July 26, 2017. Following the results of the popular consultation, the international community reacted by requesting Maduro suspend his constitutional assembly project. Canadian Prime Minister Justin Trudeau denounced the constitutional fraud of the Maduro project. Brasil, Argentina, Uruguay and Paraguay threatened Venezuela with permanently suspending its membership in Mercosur. Spain, Germany and the European Parliament have declared that they will not recognize the results of an illegal and illegitimate constitutional assembly. The European Union threatened Maduro with individual and selective sanctions if it goes ahead with his plan. 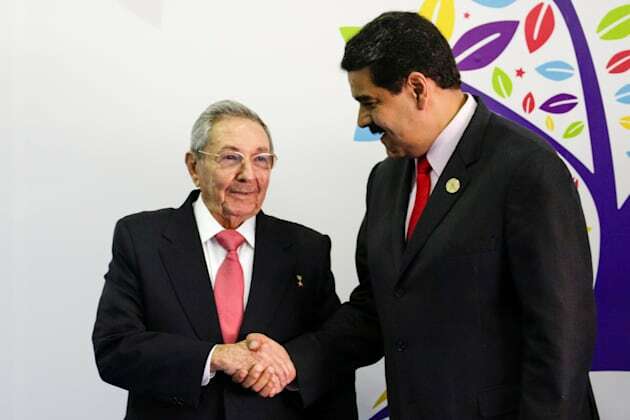 President Santos of Columbia visited Cuban leader Raúl Castro to persuade him to support a regional diplomatic strategy to stem the growing crisis in Venezuela. Cuba is the main ally of the Maduro regime. An exit from the crisis would necessarily involve the exile of Maduro and his relatives with a guarantee of impunity for the crimes he had committed. Venezuela's President Nicolas Maduro (R) welcomes Cuban President Raul Castro to the 17th Non-Aligned Summit in Porlamar, Venezuela September 17, 2016. The international community has a narrow window of opportunity to take diplomatic measures and put pressure for a solution to the crisis involving the return to democracy and the rule of law. Until now, declarations of support abound but concrete actions are insufficient. 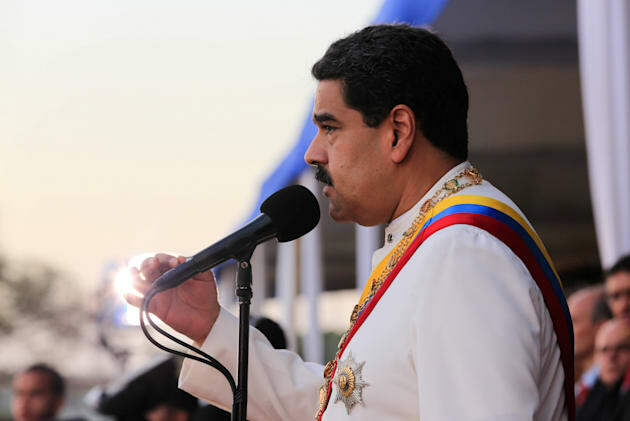 On the other hand, Maduro continues to maintain the Constituent project despite international pressures and President Trump's threats to impose economic sanctions especially in the oil sector. On July 30, Maduro is organizing an election that will select 545 delegates to the special convention to rewrite the constitution of President Chávez. The opposition has simply ruled out participating in what it sees as a tactic of the regime to avoid lost elections and ultimately to abolish parliamentary democracy. 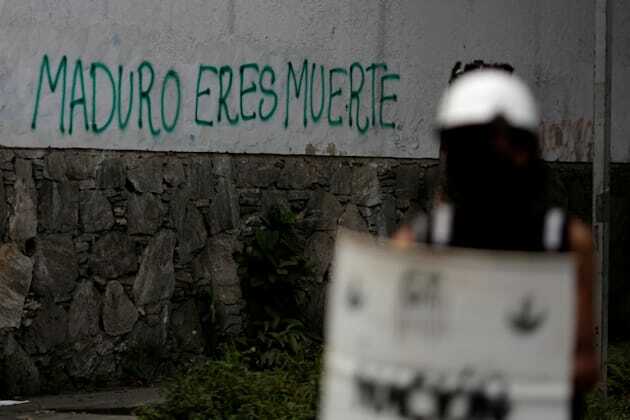 Graffiti that reads "Maduro is death" is seen next to a roadblock during a strike called to protest against Venezuelan President Nicolas Maduro's government in Caracas, Venezuela July 26, 2017. What is less understood is the factor that will make any political change in this rogue state more difficult because the Maduro regime is home to not only a radical socialist clique but also major polarization and confrontation has now reached its maximum with the involvement of transnational crime. The risks that the crisis is degenerating into an escalation of violence are great. If Maduro persists in his plan to institutionalize the dictatorship, the international community must jointly act against the drug cartels and the organized crime involved in the country, be it the freezing of accounts and banking assets and arrest warrants, systematic start-up investigation of targeted persons or their families in tax havens. Henceforth the Venezuelan crisis must be treated as an attempt by powerful drug cartels to appropriate political power in Venezuela. Venezuelans have clearly demonstrated their willingness to live in peace in a democratic country. They are entitled to expect a more vigorous intervention by the international community.